Our wedding flower packages are designed to give afordable and stylish wedding flowers, by leaving it to us to design and create your wedding flowers for your special day. There are different package options starting from £70.00 please take a look at which of our package options best suites you. We can Taylor any option to better suite your requirements if needed. The price will be adjusted based on your individual needs. Local Delivery and set-up is included in the price. 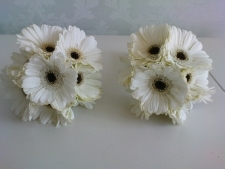 Wether your going for Vintage or Elegant, traditional or modern we can create the look your after with our chosen flowers. 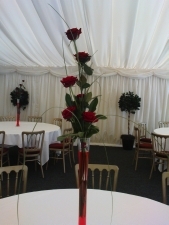 As experienced florists we have created many wedding's and we always choose flowers and foliages based on the specific style or look you are trying to achive for your special day and we choose the best seasonal varieties available using your colour scheme. We will always try our best to include the varieties of flowers you love or use a close likeness and will always avoid the flowers you dislike. All our packages include the Brides Hand-tied bouquet and you can choose to have this in a compact or natural in style (you can email us a picture of a bouquet you like for inspiration if you prefer) and we will create all other floral items inkeeping with the brides bouquet. Some of our favourite flowers we like to use depending on seasonal availability include Roses, spray roses, calla lilies, hydrangea, , gerberas, freesia, lisianthus, peony, dahlia, gypsophilia, ranuculas, bouvardia, stocks, Veronica, aster and various types of foliages such as different eucalyptus varieties, dusty miller various fragrent herbs such as rosemary, sage, soft Ruscus, bear grass, chia grass, ivy and ferns, to name but a few. If you require any additional flowers we can add these onto any of the package options and the price will be altered accordingly. If you feel that any of our wedding flower packages are right for you and would like to discuss one of the package options which best suites your individual needs then don't hesitate to get in touch. We will need to check our availability for your wedding date first as we can only take one wedding booking per week day / weekend and dates can get booked up quite quickly. 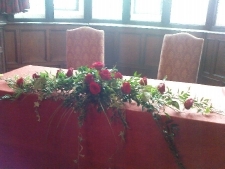 If your wedding date is available and you do decide that you would like for us to create your wedding flowers and you would like to go ahead and book your wedding date we do require a booking fee to secure your date. We take a £95.00 booking fee to secure the date (or if you are choosing package option 1 the full amount will be payable on booking) , the £95.00 booking fee comes off the total amount owed and the final balance is due 4 weeks prior to your wedding date its that simple. We always issue you with copy of your wedding flower requirements to ensure that you are happy with everything that has been ordered. We go over your wedding flower order 4 weeks before your wedding and finalise all the details of your wedding flower requirements, delivery times and delivery address(es) and any additional requirements or questions that you may have. 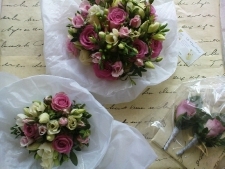 We ensure that your happy and can have peace of mind when choosing us to create your wedding flowers.